Price: $5 $10.99 54.50% off i The regular prices might have a slight change due to amazon seller's control. PERFECT FOR INDOOR AND OUTDOOR USE： Avoid overcooking or undercooking your food by using this BBQ thermometer from SUNAVO. With perfectly cooked beef, chicken, pork, fish, lamb and turkey this thermometer also works great with beverages, deep frying, making candy and breads along with heating water, milk or even water for showers. PREMIUM DUAL PROBES： The probes have been designed with 4 seconds response time and to quickly and precisely measure food temperatures. The temperature range is -58°F~572°F（-50℃~300℃）. They are also CE and ROHS certified. IPX5 WATERPROOF FUNCTION ： The thermometer comes with an IPX5 Waterproof rating and is well coated all around. It is easy to clean and you can rinse the whole unit directly under the tap. CONVENIENT TO STORE : The bottom of the thermometer is equipped with a kitchen hook for hanging. The back is fitted with a magnet that can be attached to your fridge or other magnetic surfaces. 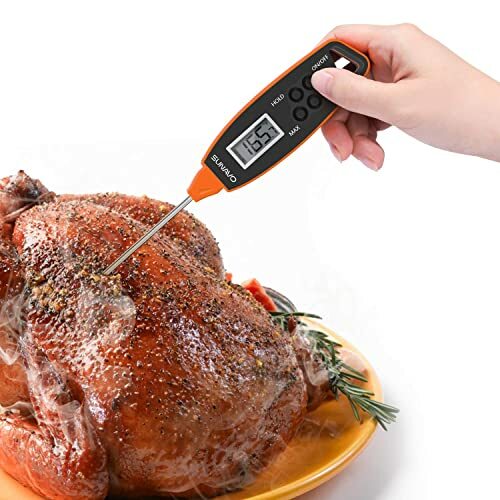 Hey,come to try MT-24 Instant Read Turkey Meat Thermometer Waterproof Digital Cooking Food Thermometer with Long Probe for Grill Kitchen BBQ Smoker Thermometer,Christmas now.It's a trial rebates.